Tanzania in the science headlines?!? I can’t remember the last time Tanzania made the science news. Maybe during the Leakeys’ days working at Olduvai Gorge, unearthing the history of early hominids? 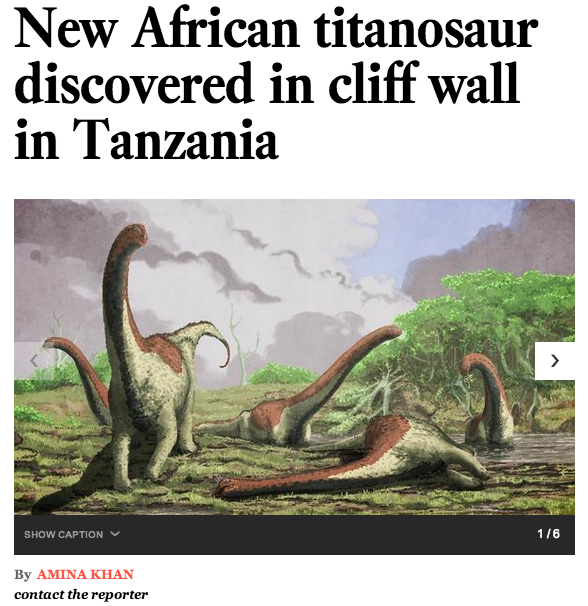 In any case, it’s a rare event, but some archaeological work in southwestern Tanzania just made the science news in one of America’s biggest papers: the Los Angeles Times. Image from screen capture: LA Times Science Now, 10 September 2014. It turns out that gigantic herbivorous terrestrial dinosaurs roamed this part of Africa about 100 million years ago, when Africa and South America were part of a large supercontinent called Gondwana. The article also nicely summarizes how the fossil record continues to boost our understanding of the process of evolution by natural selection. Give it a read. This entry was posted in Uncategorized and tagged archaeology, biology, cool stuff, dinosaur, evolution, Gondwana, natural selection, paleontology, Tanzania, titanosaur. Bookmark the permalink.